Joe Pye weed is an amazing wild edible plant that is an herb, a wildflower, a butterfly plant and looks great in cultivated flower beds. The origin of the common name of this plant is uncertain however the most prevalent theory holds that it refers to a Native American named Joe Pye (Jopi), who used this perennial plant to cure typhus in the 1800’s. This is a hardy perennial that blooms when many other plants are finished and it lasts until the first hard frost. When made into a tea, it has many health benefits. Its other name, gravel root was listed in the U.S. Pharmacopoeia from 1820 to 1842. 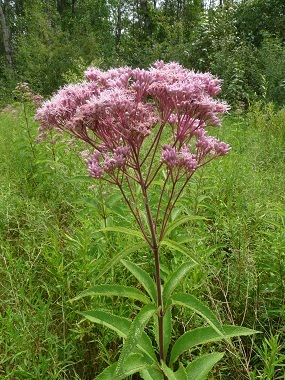 Distinguishing Features: Joe Pye weed boasts beautiful plumes of lightly-scented pink (and sometimes purplish) flowers at the ends of the stems from about July to late fall depending on location. Flowers: The flower heads are generally large, domed or flat-topped clusters of small pinkish tubular disk flowers. They bloom from July to September. 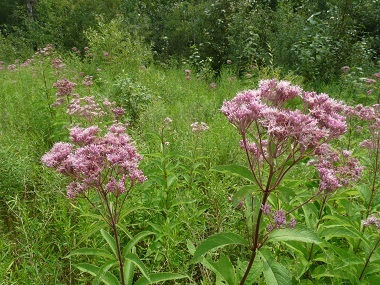 Fields of Nutrition has medicinal benefits and vitamin/mineral content of Joe Pye Weed. Leaves: Joe Pye weed leaves are whorled and can grow as long as 25 cm. They can grow to be as wide as 10 cm. There are usually four to seven leaves to a node and each leaf is lanceolate to elliptic, toothed, rounded and somewhat irregular. The surface of the leaf is generally rough. Height: Can reach 3 metres high in the southern U.S. but in most areas of Canada they average about 1 metre. Habitat: This plant is found in moist woods, fields and marshes, damp thickets, and along streams. Edible parts: The entire plant can be used including the root. The leaves and stems can be harvested in the summer before the flower buds open and can be dried and stored for later use. The roots are harvested in the autumn. Fresh flowers can be used to make an herbal tea.